One of the first anti-official stories I ever heard on coming into the sport was by one of Scottish sport’s most respected officials, David M Bowman of Clydesdale Harriers. It was of the days when athletes achieving a particular time in their event were awarded a standard badge, whether they were medallists or not and the standard time for the marathon was marked by a starting pistol being fired into the air. It was about Tommy Rewcastle of Plebeian Harriers who finished the SAAA Marathon Championships in three hours and one second when the standard was three hours – the starting pistol was fired almost in his face as he crossed the finishing line one second outside the standard. David was always a runners’ man and a marathon runner himself but he was really incensed about this more than ten years after the event. Justifiably so in my opinion. I was told the story in about 1960 or 1961 when I was starting to get selected for the E-G and Plebeian Harriers were on their last legs by then – the last appearance in the E-G was in 1957 and although some individuals turned out on the national cross-country championship into the very early 60’s, it folded about that time. James Neilson, the founder and driving force had died towards the end of 1948 and the tribute to him will be printed below. Percy Cerutty said that only the forgotten are dead, so how is it that a really first rate club such as Plebeian Harriers is forgotten? And how is it that a club from south of Glasgow had such a name? Two questions ask themselves – was the club as good as it seems, and when did it appear on the stage? First, it was undoubtedly a very good club. It was at its redoubtable strongest in the 1930’s and it overlapped the War. We could maybe start by looking at the statistics. If we have a look at the National cross-country results, starting in season 1925/’26 we have the following. 1927-28 2nd Tombe 4, Gunn 5, Rayne 10, Connelly 26, McCallum 36, James 41 Rayne came in as a first year Junior. The club did of course provide several international athletes, the most prolific of whom was WJ Gunn who represented Scotland in 1928, 1929, 1930, 1931, 1932 and 1936. M Rayne with one run in 1930 and SK Tombe with three (1928, 1933 and 1934) were the others. I have shown enough above to indicate that the Plebeian Harriers was one of Scotland’s top clubs with many really first class runners in their ranks. Other than Alex Armstrong, I can’t see any who were members of other clubs prior to their debut for them, and Maxwell Rayne was a first year Junior when he was tenth in the National in 1927-28. The Scottish team at the 1933 ICCU Championships at Caerleon, Wales. SK Tombe (Plebeians) is third from the left. Others are H McIntosh, J Givin, J Suttie-Smith, J Flockhart, WD Slidders, W Hinde, R Gatons and RR Sutherland in black jersey. Seated: J Wilson. The photograph at the top of the page comes from a tribute to James Neilson published in the ‘Scots Athlete’ in the December 1948 issue of the magazine and it is reproduced in full here. Never could that much abused word ‘sportsman’ more literally or truthfully describe anyone than the genial, warm-hearted Jimmy Neilson, whose sudden death at his Netherlee home recently saddened a huge circle of friends in this and many other sports, for he was all that we mean when we speak of the perfect sportsman. Generous in victory and cheerful in defeat, he made friends quickly and kept their esteem always. His sage advice on athletics and there were few so shrewd advisers, was unstintingly given, but I think the secret of his success and popularity was the whole-hearted enthusiasm he threw into everything that took his interest. From his youth he was vitally interested in sport, and he competed successfully as a Bellahouston Harrier, but it was with Plebeian Harriers, the club he founded, that his name became synonymous. And Jimmy really WAS Plebeian Harriers. Starting off with a bunch of young lads, he fired them with his own infectious zest, inspired in those around him a grand team spirit, so that Plebeian swiftly advanced to become one of our leading clubs and to win all the main honours in cross-country. 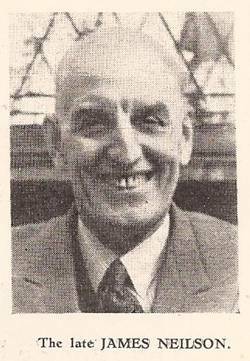 Reward for the diligence of the young club’s pioneers working under Jimmy’s organising influence, came when the club won title after title, and particularly when racing for youths became general, for to catch them young was always his theory, one which he had to defend against many critics. But it was in relay racing that the “Plebs” made their biggest hit. They won the Western Relay and were four times successful in the Midlands relay, while their special training and Jimmy’s shrewd, carefully studied tactics made them supreme – against, man for man, more renowned teams – in the early Edinburgh to Glasgow relays. Successes in this race probably gave Jimmy Neilson a bigger kick than any other, for “Plebs” although they kept on winning were never the form selection. As a legislator he was equally forthright and hard working. He was an Hon. Vice-President of the National Cross-Country Union. Aye, Scottish athletics is much the poorer by his passing. So many of us have lost a loyal affectionate friend. After the war they kept on competing and turning out in the traditional road and country races but the results were not as good as before the war. They continued to slide down the team results sheet and by January 1955 they were twenty third in the McAndrew Relay. 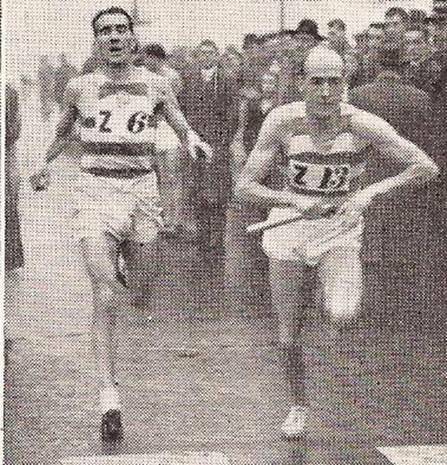 In November 1958 they were a lowly tenth in the South Western District Cross Country Relay at Paisley. They did produce some very good runners and there were two in particular worth looking at in detail. Their two best athletes after the War seemed to be Alex Smith and then Alec Small. Smith first appears in the records as a Youth in 1946-47 when he was thirty first and second scoring runner in the Plebeians third placed team. Two years later he was twenty second in the team that was third in the Junior championships and as a senior man he was thirty eighth in 50-51, and fourteenth in 51-52. Alec Small appears as a Junior in the 1952-53 championships when he finished seventeenth before turning out as a senior the following year. He was forty fourth in 1953-54, missed two years before turning out for Victoria Park in 1956-57 and placing tenth, in 1957-58 where he was thirtieth and 1959-60 when he was away back in 122nd which was his last appearance in the National. It was a bit different on the roads in the Edinburgh to Glasgow relay. Alex Smith’s first showing was in November 1949 when he was third fastest on the third stage and kept the club in thirteenth position. He was equal sixth fastest with Alex Breckenridge in 1950 when coming from nineteenth to thirteenth on the second stage. His first fastest stage time was in 1951 on the second stage when he brought his club from fourth to second although it would eventually finish fourth. 1952 was the first time the two Alex’s would be in the same team. Alex Smith was on the second stage where he brought the team from fifteenth to seventh with the fastest time of the day, and Alec Small was on the sixth stage where he dropped from seventh to eleventh. A year later they ran first and second in the team that finished thirteenth – Small was fourth on the first stage and then Smith dropped down to ninth on the second. In 1954, Smith was again on Two where he was eighth fastest and brought the team from fifteenth to tenth, while Small was on Six again and with a very poor time, was good enough to stay in fourteenth. No Alex Smith in 1955 meant that Alec Small was on the second stage and he came from thirteenth to ninth with the seventh fastest time. In 1956, with ninth time on Stage Two, he came from twentieth to fifteenth in the seventh fastest time. In 1957, when the club finished twentieth, he was not there and the following year Plebeian Harriers were out of the event for good and Alec was running for Victoria Park. He ran for Victoria Park for a couple of years but eventually emigrated to Canada. Plebeian carried on but the last result in the SCCU Championships where they are mentioned is that for 1963 when only two men ran – and they finished 134th and 136th. So we now have approximate dates and as part of the search for the origins, I went to Colin Shields’s book “Whatever the Weather: the official history of the SCCU”. He says, “the sport grew in popularity after the War with new clubs constantly being admitted to the Union. These included Dumbarton AAC, Eglinton H, Plebeian H, Mauchline H, Canon ASC, Selkirk H and Beith H. …… One application caused such controversy that it was referred for consideration to the AGM. 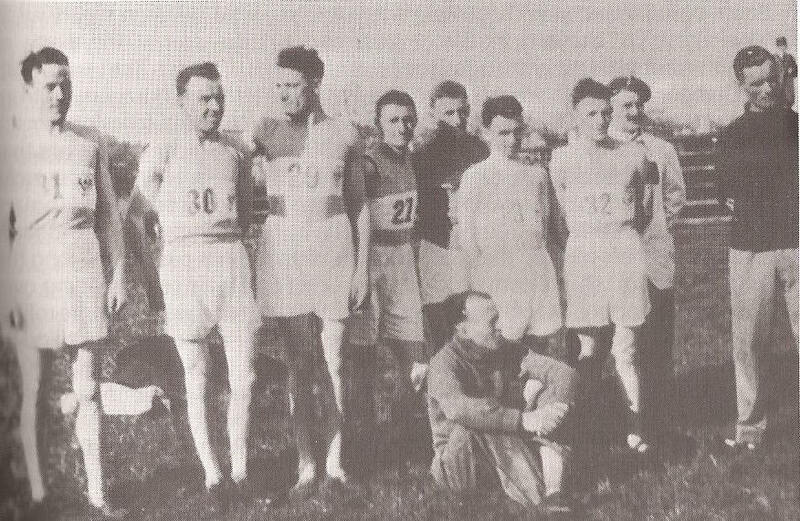 This was from the Socialist Harrier and Athletic Club and was, after a great deal of discussion, rejected by 19 votes to 14 with the justification that the proposed name and the red flag on their vest was objectionable.” One of the theories being floated by some of us was that the club had sprung from the Worker’s Educational Association, or the Trades Union movement following the English example of setting up Cycling Clubs, Swimming Clubs and even a ‘London Plebeian Harriers’. The latter seemed a promising lead but it would seem that the truth is simpler – it was set up in Glasgow and Renfrew by experienced Scots. The name is still a bit of a mystery – we know of the Roman Patricians and Plebeians of course but if anyone why the name was chosen it would be interesting.